Catalogue of Organisms: Where To Next? As some of you may have noticed over the course of the past year, I have an interest in phylogenetically problematic taxa. I think anyone with even a passing interest in evolutionary matters does: few things appeal to the human spirit more than a good mystery. So I've decided to give you my own completely-biased, not-in-the-least-bit-impartial list of the ten taxa that I think currently spark the most phylogenetic questions, based on nothing more than my own subjective judgement. 1 - Stylophora: These featured here a couple of weeks ago. I think a case could well be made that this is the single most confusing group of organisms in all of palaeontology. What is one to make of a group of animals for which researchers cannot even agree on which end is the front and which the back, which way up they go, and which may occupy a critical position in our own evolution, or may have nothing to do with it? Nearly three years ago I wrote a page for Palaeos.com on these animals. When I started writing the page I favoured one reconstruction, by the time I finished I was feeling a lot more uncertain. There was a lot more going on in my head than those ten short paragraphs let on. Photo by Linda de Volder. 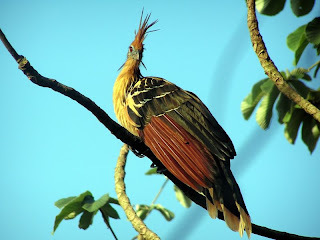 2 - Opisthocomus hoazin: The hoatzin, the prime exemplar of all things uncertain in avian systematics. Arguably not as problematic as some other things on this list (at least we can be sure that it's a bird), but it still well deserves its place here for the sheer volume of time and effort that has gone into the seemingly almost futile attempt to pin it down among its feathered associates. The hoatzin is famed for its vile odour and loud call, as it laughs derisively and farts insolently at the unfortunate systematists it has reduced to tears through its intransigence. 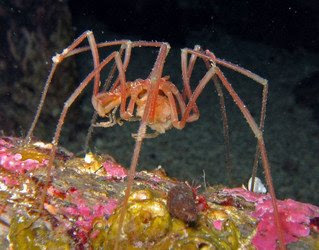 The pycnogonid Nymphon gracile. Photo by Asbjørn Hansen. 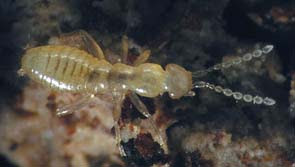 The palpigrade Eukoenenia mirabilis. Photo from here. 4 - Palpigradi: When you first see one of these tiny arachnids, you might think they look much like a miniature whip scorpion. Then you look a bit closer, and discover that it appears to be a whip scorpion constructed out of bits of mite. After that, it gets confusing. Palpigrades are widespread in tropical and subtropical regions of the world - there's even a couple of marine species living amongst the meiofauna - but they're not letting anything on about their affinities without a fight. 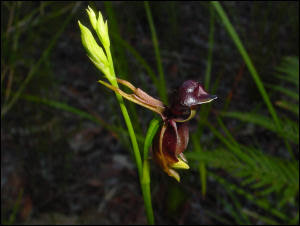 The flying duck orchid (Caleana major). Photo by Katrina Leel. 5 - Angiospermae: They're all around us. Look out almost any window and you'll see hundreds of them - the grass, the trees, the scraggly little weeds that force their way up between pavers. Our lives are shaped by them. In fact, we would never exist without them. They feed us, clothe us, inspire us. But where did they come from? At one point, researchers thought they had a pretty good idea of the origins of flowering plants, but in the past two decades molecular data have cruelly conspired to make our understanding far more shaky than it once was. They may rule the planet now, but they might as well have come from outer space. Galapagos tortoises. Photo by Nathan Farb. 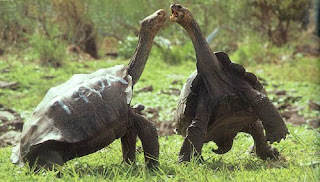 6 - Testudines: And speaking of organisms that might as well have come from another planet... The earliest known fossil turtle comes from more than 200 million years ago. It lacks a few of the features of modern turtles, but it's still quite unmistakeably a turtle. Since then, turtles have thrived and spread to all corners of the planet, but in all their diversity of forms, they're still unmistakeably turtles. The lack of intermediary fossils and the all-encompassing carapace (complete with limbs moved inside the rib-cage) do an exemplary job of disguising which other group(s) of reptiles the turtles call their nearest and dearest. Unless, of course, the Germans are on the right track with their "schildkröten", and they're really just frogs out to fool us. The Carboniferous problematicum Tullimonstrum gregarium, reconstructed alongside Escumasia roryi (the y-shaped organisms) and Etacystis communis (the ones that look like Wu-Tang Clan symbols). Painting by Stanton Fink. 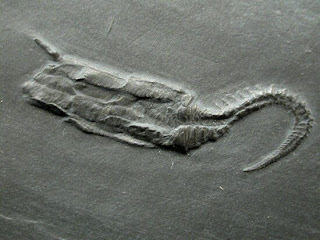 7 - Tullimonstrum gregarium: The so-called "Tully monster" is known from one place and time only - the Carboniferous Mazon Creek lagerstätte of Illinois. As indicated by the name "gregarium", it occurs there in considerable numbers, probably in the thousands. And yet nothing else is known anywhere that looks anything like it. 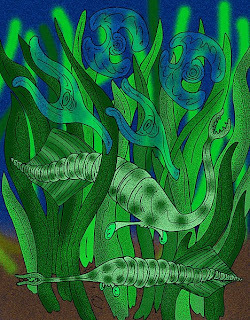 In the years since its description, Tullimonstrum has been a gastropod, a nemertean, even a super-derived descendant of the Cambrian stem arthropod Opabinia. It has also been suggested that a giant descendant of Tullimonstrum yet lives, and is making its living by calling itself "the Loch Ness monster" and posing for tourists. This theory remains unproven, and rumours of an impending lawsuit for copyright infringement being brought by the plesiosaurs are entirely speculative. The unplaceable eukaryote Stephanopogon. Photo by NEON ja. 8 - Stephanopogon: Stephanopogon looks like a ciliate. 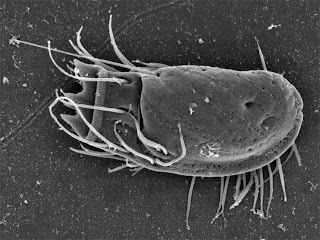 For many years, it sat cosily amongst its fellow ciliates, sometimes even given pride of place for its features as a link between the ciliates and their flagellate relatives. But the closer it was scrutinised, the more "flagellate" and less "ciliate" it appeared, until eventually the horrified ciliates realised that it was not one of theirs at all, but a horrid interloper! Now poor Stephanopogon floats aimlessly among the unicellular eukaryotes, looking for a place to call its own. There are rumours that it may yet be accepted among the discicristates, but will the fair Euglena and shy Naegleria be able to forgive their new confamilial's shady past? Only time will tell. The zorapteran Zorotypus hubbardi. Photo by David Maddison. 9 - Zoraptera: Zorapterans, or "angel insects" (if angels are fond of living among decay) have been featured before on this site. Despite the small number of known species, this is the most phylogenetically problematic of all insect orders. Relatives of cockroaches, crickets or the outgroup to Holometabola? You decide. Lobatocerebrum psammicola. br = brain. Photo from Rieger (1980). 10 - Lobatocerebrum psammicola: When first described, Lobatocerebrum was included with the Annelida, the well-known phylum of coelomate, segmented, chaetae-bearing worms, and that is where it has tended to stay. 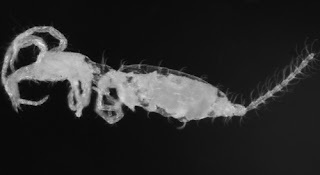 The problem is, this minuscule member of the meiofauna is acoelomate, non-segmented, and lacks chaetae. It is the supposed annelid that has lost almost the entire complement of annelid features. Lobatocerebrum is an annelid that is doing its best to be a flatworm, or a flatworm that is doing its best to be an annelid, or something else entirely. Or maybe its just one of those things that exist simply to give systematists headaches. Rieger, R. M. 1980. A new group of interstitial worms, Lobatocerebridae nov. fam. (Annelida) and its significance for metazoan phylogeny. Zoomorphologie 95 (1): 41-84. The hoatzin is famed for its vile odour and loud call, as laughs derisively and farts insolently at the unfortunate systematists it has reduced to tears through its intransigence. But surely it is most famed for the clawed fingers in the juvenile form ... which it uses to "flip the bird" at systematists. The giant pycnogonid hanging above my office door is generally taken as an artlessly fabricated fake spider even by those who should really know better! And everyone knows that turtles are just derived placodonts! Palpigradi, wow I learn something new each time I visit your Catalogue! Sounds like an italian mob or some version of paparazzi. Weird little buggers! Nice list, its sad to think how long the list really extends though. Its also exciting to think of the research possibilities too! "The hoatzin is famed for its vile odour and loud call, as it laughs derisively and farts insolently at the unfortunate systematists it has reduced to tears through its intransigence."